Through partnering with each child’s family, we come together to make this early learning experience a memorable and positive one. Please view the words of past and present families who took the time to share their success stories from Peapod. We are committed and delighted to take this journey with you and your family, and want to stay connected. We do this through meaningful interactions upon arrival and dismissal. Peapod Learning Center fills out a “My Day” form for each child that gives details about naps, meals, and daily activities. A weekly newsletter is sent out informing parents of important days, reminders, and the learning that is taking place. We also provide activity and meal calendars, and use Facebook to keep families informed. Meals at Peapod are a time to learn, enjoy a nutritious meal and have fun with friends. Both locations serve breakfast, lunch and a snack that meet the requirements of the USDA’s Children’s Food Act. The Preschool serves milk, and at the Learning Center we provide milk and formula for babies. 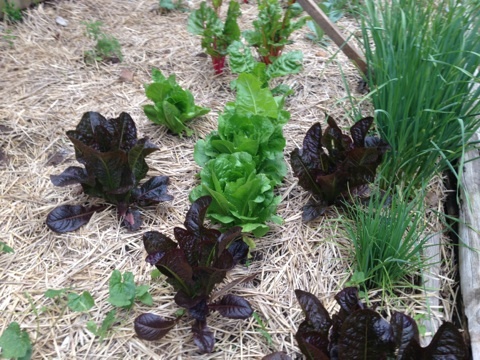 Many of the meals are homemade with fresh ingredients from our garden. At the Preschool, the food is served family style. Family style meals provide real-life opportunities for learning about manners, respect of others, and becoming an independent thinker. We offer each the child the opportunity to be a “Snack Star” each month. Learners can practice making healthy eating choices by selecting a delicious and nutritious snack to share with their friends at Peapod. We also provide a meal calendar to inform families of what is on the lunch menu each week. We are open 7 a.m. to 6 p.m., Monday through Friday. 2. What ages do you serve? We enroll children who are 6 weeks through 5 years of age. 3. What holidays are you closed? As a state licensed center we observe all federal holidays. There is no deduction in tuition for holidays. 4. Can you go part-time? We do our best to serve and accommodate all families and their varying schedules. Depending on our availability, we often take children part-time. Yes, we are a state licensed center and we are accredited through Missouri Accreditation. Being licensed requires that we abide by strict sanitation and safety guidelines, along with health and program standards. We are frequently inspected by the state to ensure our facility meets the licensing regulations. 6. What is your educational philosophy? At Peapod we are learning to play, and playing to learn! We recognize and embrace each child as a unique individual. We create a child-directed learning experience where the child can construct his/her own knowledge through teacher guided interactions with their physical and social environments. Our safe and nurturing atmosphere encourages children to actively discover and explore the world around them. Peapod values the importance of family in the growth of each child. 7. What is your caregiver to child ratio? 8. What is your staffs educational background and experience? Our director/owner has a bachelor’s degree in Elementary Education and a Masters in Reading. Our lead teachers have a bachelors in Elementary Education, and assistant teachers have a minimum of 2 years college experience. All staff are CPR and First Aid certified. 9. What curriculum do you use? We use Project Construct in the classroom as our curriculum. This is a developmentally appropriate curriculum that allows learners to construct their own knowledge through hands-on discovery of the world around them. 10. What type of activities do you do with the children? 11. When do children take naps? We believe naps are an essential part of a child’s day. Infants sleep on demand. As infants grow and become toddlers, we will work with parents to establish a comfortable sleep routine. 12. What meals do you serve? At both locations, we serve breakfast, lunch and dinner, plus an additional afternoon snack. All food served is in compliance with the USDA’s Child and Adult Food Program. We serve more fresh fruits and vegetables, more whole grains, and less sugar, salt and processed foods. Many of our nutritious meals are handmade using organic, garden fresh fruits and vegetables. Formula is provided for infants. Milk is provided for toddlers and preschoolers. 13. What is your outdoor space like? 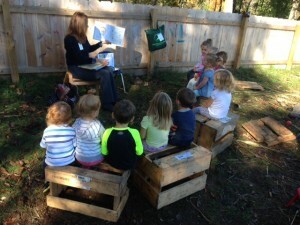 Peapod values the importance of the outdoors in the learning process. Children at both locations have several opportunities to be outside during the day. During this time, children are exposed to sensory, art, and free play activities, and have the opportunity to improve their gross motor skills. We are excited to get our Nature Explore playground up and running. We have our color plans for this outdoor space, and are actively working towards getting this built. Please check out the website below to get more information. 14. What supplies do you provide? At Peapod, we provide all food, formula, milk, and hypoallergenic wipes. Parents are responsible for diapers and/or pull-ups, diaper creams, extra change of clothing and nap bedding. 15. What educational materials do you have available? We provide a rich variety of developmentally appropriate materials, toys and games for the children. Our classroom is sure to peak the interest and curiosity of all our unique learners! 16. What is your potty training policy? When you and your child are ready to begin toilet learning, we will work with you to develop an appropriate plan to meet the needs of your child. This plan will be built on the child’s interest and physical ability to control his/her body. Children will never be admonished, punished or demeaned for toileting accidents. Parents are encouraged to bring extra changes of clothing during this process. 17. What is your sick policy? Children who have been ill are asked to stay at home until they have been fever and symptom free for at least 24 hours. Please see our handbook for a list of symptoms and/or illnesses that would exclude your child from care. Parents and staff will jointly determine when it is appropriate for the child to return to Peapod. Often an illness needs to be evaluated by a physician, medication prescribed, and any period of contagion passed. 18. What is your safety plan in case of emergency? Each location has regularly scheduled drills to practice what actions to take in case of an emergency. At each location we have a fully stocked safety bag, class rosters, and weather radio. Staff follows procedures laid out in our emergency plan packet. You are welcome to view this at any time. 19. How do you handle discipline? At Peapod, we create a safe and respectful environment through the integration of Love and Logic in the classroom. This program encourages children to take responsibility for their choices and the natural consequences of them. If discipline is required we will attempt a time-out (So Sad Time). If the difficult behavior continues, we will work with parents to develop an individual action plan. 20. What type of extracurricular activities do you provide? Peapod loves inviting educational guests into the classroom. Every month learners experience Zoo Class, hosted by the Dickerson Park Zoo, and Book Club, hosted by the Springfield Library. Every week, Stretch and Grow visits the classroom to help children develop gross and fine motor skills. 21. What is your tuition? 22. How do I register? To register your child for Peapod, simply click on the “Contact Us” button on our home page. Fill out the appropriate information, and the director will contact you as soon as possible. We look forward to speaking with you and your child.